About three days ago I have noticed some strange rash on right side of my neck and back of my head without any obvious reason. It is not itchy and does not show a sign of spreading around on my body but also it is not showing signs of getting better. 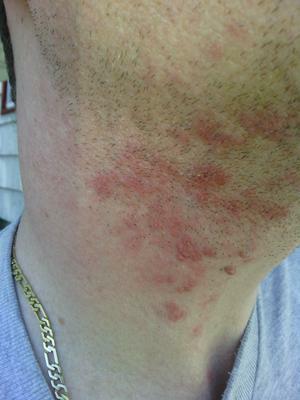 Can any one help me identify the cause of this kind of a rash from the pictures that I have provided above? I could upload more pictures if they would be helpful.